Formed in 2011 in Lancaster, Pennsylvania,THE PIG MERCHANTS are Brad Fuhrman and Adam Rohrer. Described by some as "The Decemberists… but happy," and by others as "a less talented Mumford and Sons," the duo's folk / pop sound is created through a delightful combination of tight vocal harmonies with a variety of string and percussion instruments. Their songs draw inspiration from love lost, life found and hope for the future, and evoke by turns mirth and melancholy. A list of their upcoming shows can be found to the right, so clear your calendar and bring your friends to come and bathe in the sweet sounds of the finest acoustic duo this side of the Mississippi. The Pig Merchants' debut album, "On We Go" is out now! Click the BUY NOW button below to place your order and pay through PayPal (with a credit or debit card or with your PayPal account), or come and see us live to pick one up! 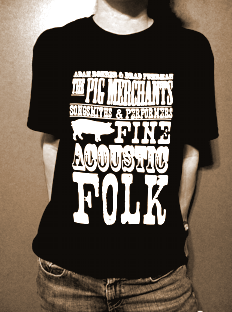 Pig Merchants t-shirts are now available in S / M / L / XL for $10! Contact us on Facebook or email us at info@thepigmerchants.com to place your order (add $2 for shipping). You can also come check out one of our shows and pick one up! 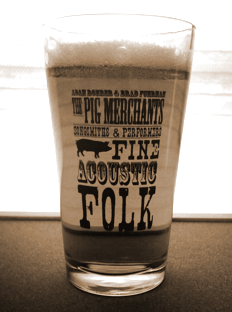 Pig Merchant pint glasses are now in! $7.00 ea. Email us or contact us on Facebook to place your order (add $4 for shipping), or come see us live! Head on over to our Facebook or ReverbNation pages to check out our photos, videos and music! Site designed by Half-Dog Design. 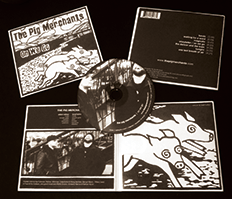 © 2012 The Pig Merchants. It's been a while since our last update, but that's only because 2013 has been a busy year! In addition to supporting our first studio record, we had the opportunity to play at a number of new (for us) venues around the midstate, including The Abbey Bar in Harrisburg, and The Chameleon Club in Lancaster. In between slinging folk music and hanging out with old and new fans, we've added a few new players to our ranks: Jesse Porter, the talented drummer from The Sketties, has been lending his mad percussion skills to TPM for the last few months, along with Dave May, a prolific and versatile Lancaster musician who's been blowing our minds with his guitar, bass, keyboard, vocal and songwriting prowess. While Adam and Brad will sometimes play shows with the original, 2-man TPM lineup, we've happily begun playing a number of full band shows in 2013. We've also been doing a lot of writing, and that's why we've decided to take a break for the rest of the year and head back to the studio. Our new record (TBD 2014) will be a full-length album featuring not only the full TPM band, but also a few sweet collaborations with some of the musicians we've gotten to play with the last few years. Follow us on Facebook for more updates, and check out our schedule to the right for where we'll be next. The Pig Merchants have joined with several other musicians to put together two shows to benefit a sweet young girl named Nina Woods and her family. Nina is currently battling osteosarcoma, a form of bone cancer, and her family is faced with very large medical bills with many more to come. Every penny from ticket sales for both shows will benefit Nina and her family. The first show will take place on Saturday April 13th at TellUs360 (24 E. King St Lancaster, PA) from 7:00-10:00pm with doors opening at 6:30. The lineup for this show will be The Pig Merchants, Canyon., Leticia Joy, and Jake Lewis and The Clergy. Tickets will be sold for $10 each and must be bought ahead of time. They can be purchased by contacting any one of the performers via Facebook, or by emailing Adam Rohrer at adamrohrer@gmail.com. Tickets can also be purchased at TellUs360. The second show will be the following night, Sunday April 14th, from 7:00-9:30, at The Cellar (145 E. Ross St Lancaster, PA). The lineup for this show will be The Pig Merchants, Canyon., Ben Rothermel, and Jake Lewis & The Clergy. There will be no physical tickets for this show. There are 45 seats available and to reserve a seat you must email Josh Gibble at livefromthecellarinfo@gmail.com and pay a minimum donation of $10 at the door. Come out for two nights of great music for a great cause! The Pig Merchants have wrapped up in the studio! Thanks again to Nathan, Mollie and Kim for helping us bring our songs to life, and Thank You to all those who supported us through our KickStarter campaign, merch sales and tips over the last year. We couldn't have done it without your help, and we hope that you'll be pleased with the result! We feel pretty good about our efforts during our three-day recording binge at Attic Studios and are looking forward to sharing our album ("On We Go") with all of you as soon as we can! The record still needs to be mixed, mastered and printed, and so we're hoping to have them in hand in late October or Early November. We'll keep you posted! If you'd like to see some pictures of our studio experience, check out our Facebook page HERE! Big things are coming for the Merchants! This Saturday, 9/22 (the first day of Autumn), TPM are playing at the Cellar in Lancaster with Sopa Sol. The evening will be very chill and will provide both bands with an opportunity to connect with fans and new listeners by talking about their music and answering questions. On Monday, 9/24, we head to the Attic Recording Studio for three days to start laying down tracks for our first album, "On We Go"! It's taken months of preparation but we're anxious to start this exciting process. We're also looking forward to bearing the fruits of three cool collaborations: Jandi Goshert (who designed--and carved--our album artwork), Mollie Swartz (who will be playing violin on a few tracks) and KimberLiana (who will be providing some sweet vocals). CD release party date, time and location TBD! THANK YOU to all our fans for helping us hit our Kickstarter goal! We set out to raise $750 and we wound up with $1,130! We're anxious to hit the Attic Studios this Fall and crank out a record worthy of your gifts. In the meantime, take a look at our list of upcoming shows and come out and hang with us. We're starting to work some new tunes into our set, and while some of them will be on our album, you can get a great sneak preview by hearing them live! Lastly, check out Lancaster artist Jandi Goshert. We've asked her to design our album art, and we're looking forward to working with her! The Pig Merchants have made two videos about the charities that will be receiving over half of our album profits. You can see Adam's video about Springs of Africa HERE, and you can see Brad's video about Gift of Life HERE. TPM are saving up to record an album, but we need the help of our amazing fans! We've started a fundraiser on a very cool website called Kickstarter where users can make donations toward projects in need of support. We're hoping to raise $750 to help fund studio time with the goal of releasing a record this Fall. But it gets better. For pledging at different levels, our fans can get some sweet perks--anything from a free digital copy of our album ($10), to a package with a free TPM t-shirt, pint glass and a one-of-a-kind song written and recorded by us for you about the topic of your choice ($75). Finally, we're not recording an album to get rich; we're doing it because we love music and we want to preserve some of work for the future (and give a little love to our fans who dig our stuff). Therefore, we're going to donate more than half of our album profits to two great charities: Gift of Life and Springs Of Africa. We'll be talking about these more in the future. To check out our Kickstarter project page, click HERE! The Pig Merchants family is growing as Adam and his wife Christina welcomed baby Layla Belle into the world on June 5th. Thirteen days later, on June 18th, Adam's brother Aaron and his wife Em greeted their first child, Fiona Knives. Happy Cinco de Mayo! Last weekend TPM were able to enjoy the Launch Music Conference in Lancaster, PA. First, we played at DipCo, and then we traveled around to a few venues, enjoying several artists, and hanging out with a few others. All around, a great weekend! One of our best new finds: Canyon. Check them out--they're good people, and fine musicians. After a brief stay in Salisbury, MD, the Merchants are back in PA and have been lining up shows at new venues through to the end of 2012! Next up is the Launch Music Conference, where TPM will be performing at The Lancaster Dispensing Co.
TPM t-shirts are now available! $10 will get you a tee and our 5-song demo CD (shipping fees not included, if applicable). Contact us by email at info@thepigmerchants.com or through Facebook to place your order. Or come out to one of our shows and pick one up in person! The Merchants have been chosen to play at the Launch Music Conference in Lancaster! Come and see us and other talented musicians April 26th @ 8:45 PM at the Lancaster Dispensing Company. We're designing some t-shirts and need your input! Head over to our Facebook Page to view the album with our potential designs, and Like, Share and Comment on the design(s) you like the most. If you Share the album on your Facebook page, you'll also be entered into a drawing to win a free tee! Thanks for your help! Also, look for us in the regional artists column of the Lancaster Intelligencer Journal this Friday! And if you need more Pig Merchants updates during the week, follow us on Twitter. Happy New Year! 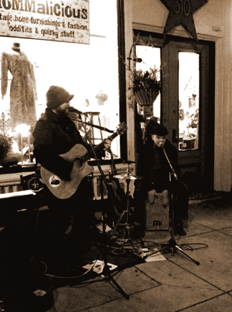 We had a great first year and we're looking forward to a successful 2012, with upcoming shows at new venues including Coakley's Irish Pub (New Cumberland), Juice & Java (Mechanicsburg) and The Coffee Company (Lancaster)! We're also busy adding new songs to our repertoire. Check out our cover of Arcade Fire's "Wake Up" on ReverbNation. The Merchants rolled back into the Ono Road Studio to record three more demo tracks: "Yellow Shirt", "Sunlight", and "If I Should Die". Now it's time to mix and master. When we're finished we'll let you know how you can lay your hands on our latest creations. In the meantime, look to the right to see where and when you can find us in 2012! We finished mixing our first demo ("The Window Song", "My Oxygen", "Storyteller / On We Go")! Recorded for free in my kitchen, it's far from perfect, but then again... so are we. So now it's back to lining up more shows, playing live, tightening up our tunes, and writing as the muses hit. In July, we played in 105 degree heat. In September, we had a show cancelled due to the worst flood in over 35 years. We then joked that our next weather crises would be a snow storm. Our show at the Strasburg Winery has been RESCHEDULED! 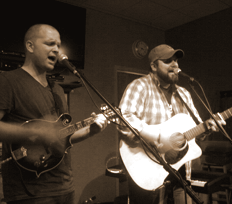 Come support your favorite acoustic duo on 9/30 @ 7:00 PM. Wine for guests over 21; music for everybody! 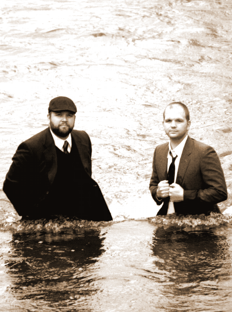 Due to the flooding in Central PA, our show tonight at the Strasburg Winery is CANCELLED. We'll be rescheduling the show for a Friday sometime in the next month or two, and we'll keep you posted! Summer '11 was a exciting formative period for TPM, and now we're looking forward to adding new venues, fans and songs this Fall. Revisit the site for show updates, follow us on Facebook for pictures and videos, or check out ReverbNation to listen to some of our music. 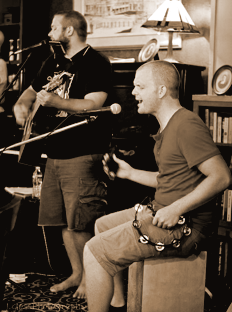 Come experience the lively harmonic swell of The Pig Merchants this Saturday, 6/25, at the New Holland Coffee Company. 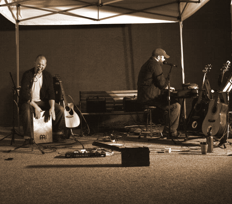 The acoustic duo will be performing all your favorites along with a few new takes on our classic hits from the twenty-eleven's. Bring your friends, drink some coffee and dig the sweet sounds of the Merchants. 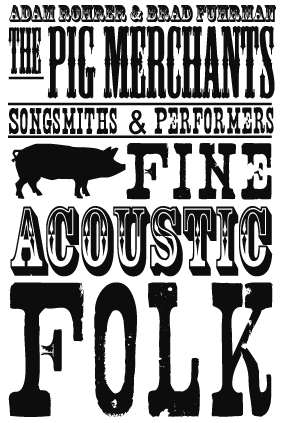 ADAM ROHRER sings and plays percussion, guitar, and mandolin in The Pig Merchants. His musical journey began as an adolescent playing drums along to punk rock records in his basement. It wasn't until he stole some albums from his brother Aaron that he began to open up his musical tastes. He cites a broad array of influences. From Fleetwood Mac to City and Colour. From Sigur Ros to Face To Face. When not performing as a Pig Merchant, Adam prefers to spend his time with his lovely wife Christina, and his three beautiful children: Jade, Thatcher, and Layla. 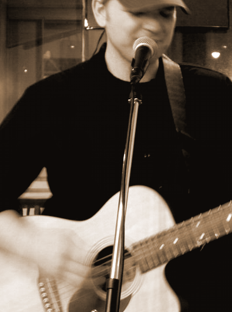 BRAD FUHRMAN is a perfectly mediocre singer, guitarist and pianist for The Pig Merchants. 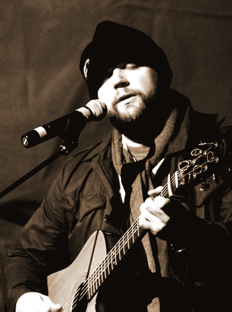 He grew up listening to hits of the 50's and 60's in his parents' station wagon, and began writing his own music as a boy on his big sister's Casiotone keyboard. His musical education continued into adolescence with the discovery of Nirvana, Matthew Sweet and Radiohead, and accelerated with the acquisition of his first guitar at 16. Music accompanied every milestone in his life, but the impetus to perform came shortly after the 2007 death of his wife, Kate. To this day, Brad continues to make sense of his world through song, and has so far found the most perfect expression of his imperfect art as a Pig Merchant. Atop a hill on a breezy, sunny October day in 2004, a Buddhist and a Christian shook hands and said 'Hello.' Several years later, through a series of circumstances--some tragic, some serendipitous--they began to play music together. 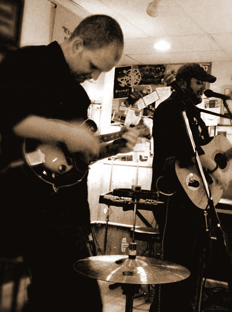 In May 2011, the two musicians officially joined forces, and THE PIG MERCHANTS were born. Currently residing in Lancaster, Pennsylvania, The Pig Merchants are Brad Fuhrman and Adam Rohrer. Described by some as "The Decemberists… but happy," and by others as "a less talented Mumford and Sons," the duo's folk / pop sound is created through a delightful combination of tight vocal harmonies with a variety of string and percussion instruments. Their songs draw inspiration from love lost, life found and hope for the future, and evoke by turns mirth and melancholy.